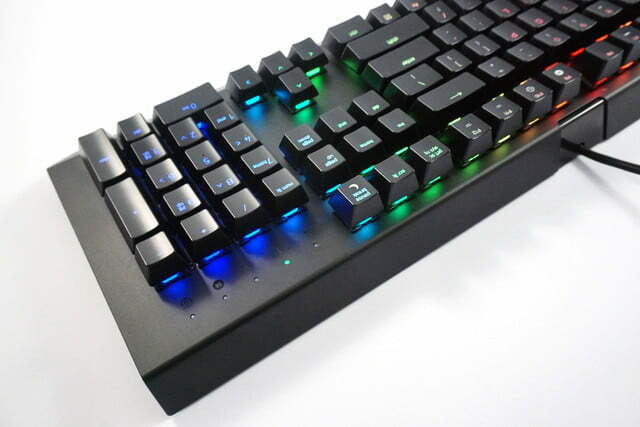 The BlackWidow X series is the perfect introduction to mechanical keyboards. 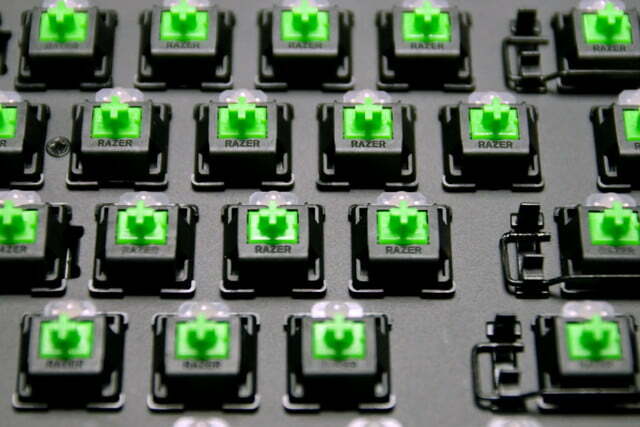 Razer is often the first brand gamers try when they put a toe in the deep, dark waters of mechanical keyboards. But the BlackWidow series, Razer’s old go-to, was first introduced in 2010, and it’s showing its age. Its reputation took a knock when Razer switched to its own “clone” switches (provided by Chinese manufacturer Kailh), and stopped offering Cherry MX. 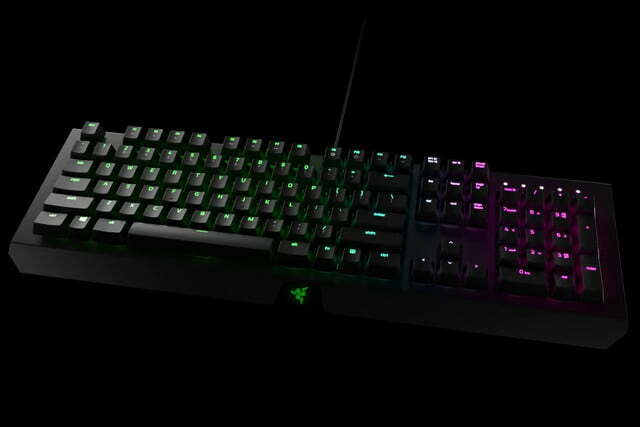 That change, and the BlackWidow’s somewhat divisive styling, has given competitors a chance to gain on Razer’s dominate position. 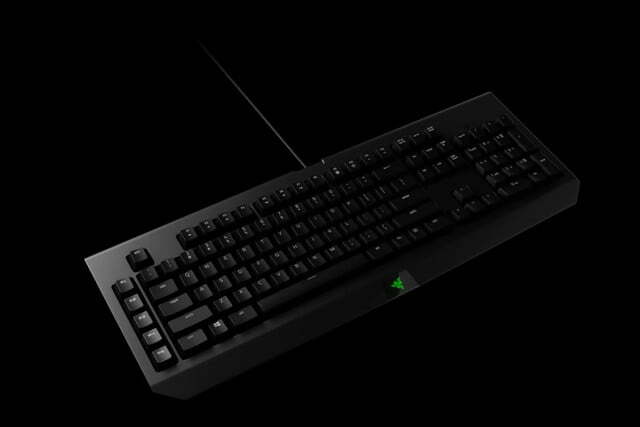 But Razer has a response with its new BlackWidow X, a slightly more affordable alternative to the standard BlackWidow. It showcases a few improvements over the original design. The X series does away with the five macro keys on the side of the board, but in its place is a more standard key layout, an exposed metal top plate, a smaller, sleeker body, and a cable routing system. 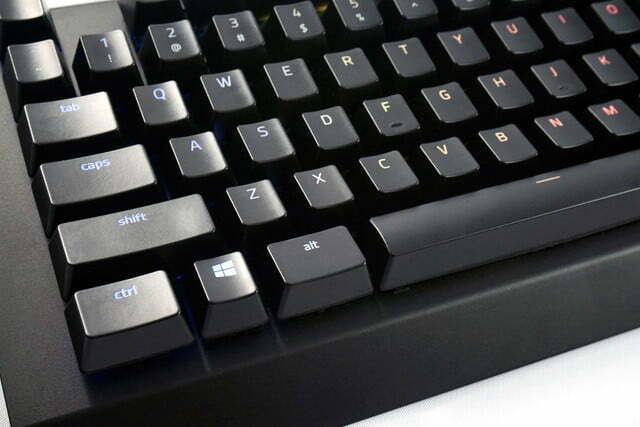 Even the font on the top of the keys is more conventional, and much more appealing. 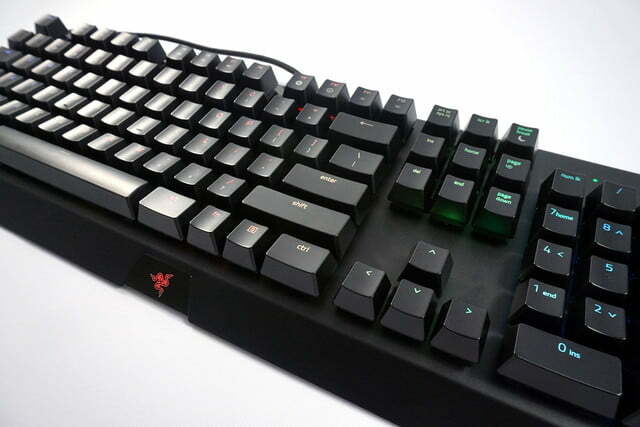 On top of all that, at least some models in the X series are offered with Cherry MX Blue switches, a long-time favorite among gamers and typists alike. 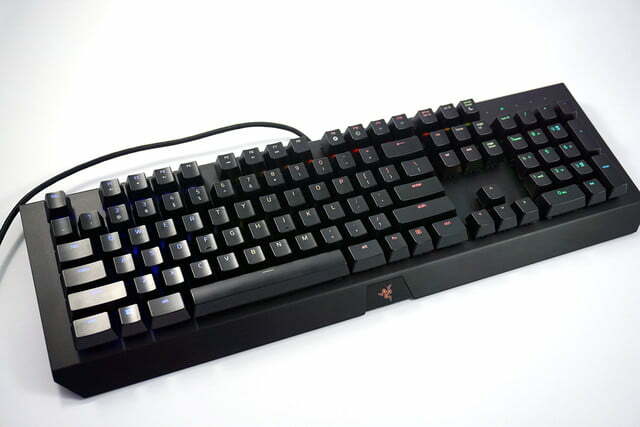 In short, despite its lower price, the BlackWidow X series improves upon its progenitor in nearly every way. The most striking change in the BlackWidow X is its exposed metal frame. 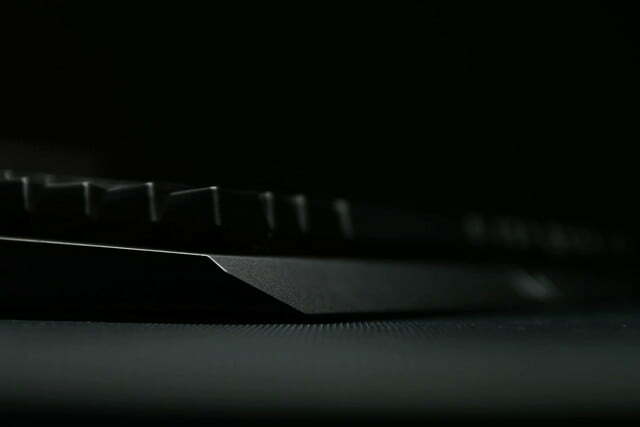 The top of the keyboard is one single piece of metal, wrapping around the top edge, across the key area, and down to the tapered bottom lip. Without the bulky, stylized plastic shell on the older models, the newer design feels smaller both vertically and horizontally (macro keys notwithstanding). 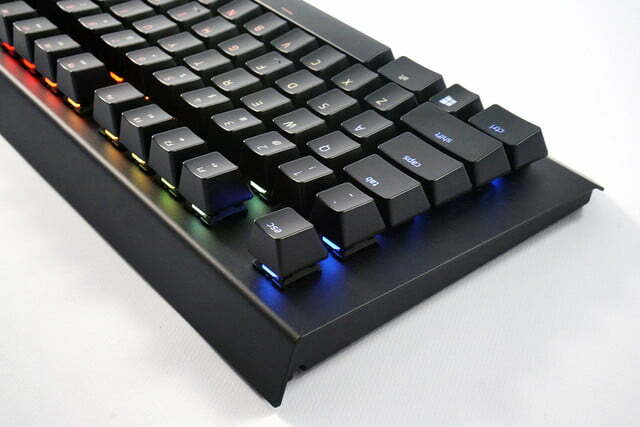 While this is desirable for anyone looking for a little extra desk space, it also makes the keyboard feel more solid and more premium, comparing well to the similar exposed decks of Corsair’s K series boards. Underneath, the body switches to plastic to house the keyboard’s electronic components. 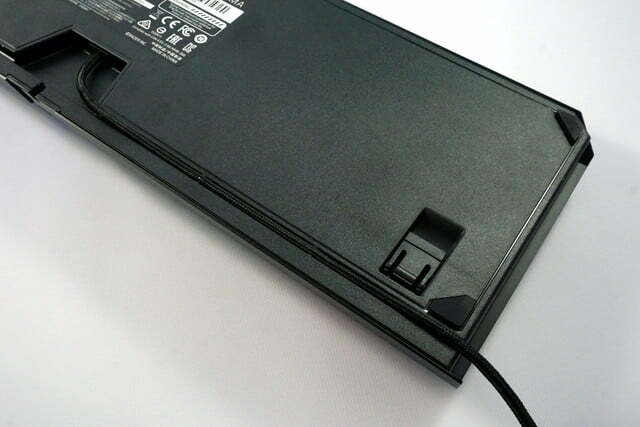 The bottom has a new trick, too, a recessed well and two grooves that allow the thick, braided USB cable to be routed to the front or either side. 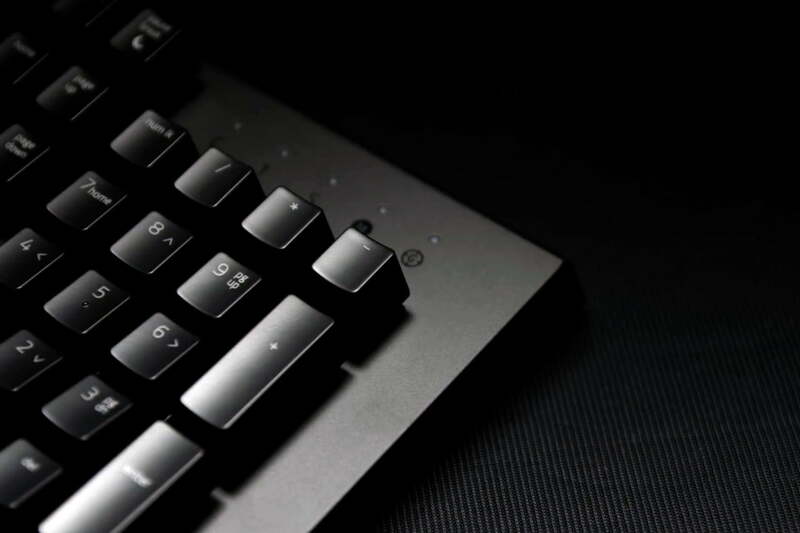 While a detachable cable (often seen on premium, semi-custom mechanical keyboards) would be preferable, the cable routing option is a huge improvement on the bulky and largely immobile cable on older BlackWidow models. The keys are mostly the same as other Razer mechanical models, with the same soft-touch plastic finish that resists fingerprints. 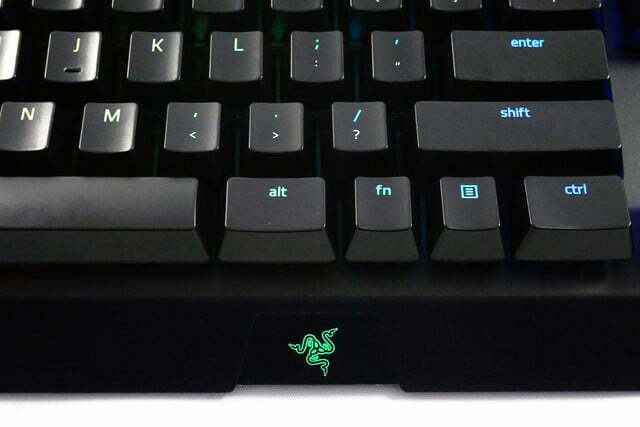 But Razer has seen fit to use a standard key font, which is much more readable than its stylized, self-designed font with the distinctive lowercase “r” key. 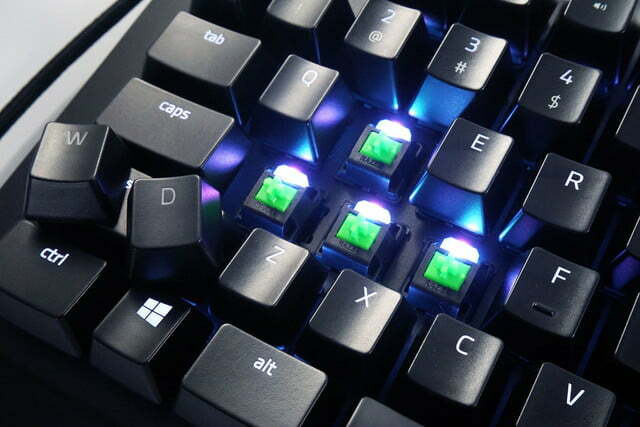 LED indicators above the 10-key area designate caps lock, num lock, scroll lock, on-the-fly macro recording, and “game mode” (which disables the Windows key). 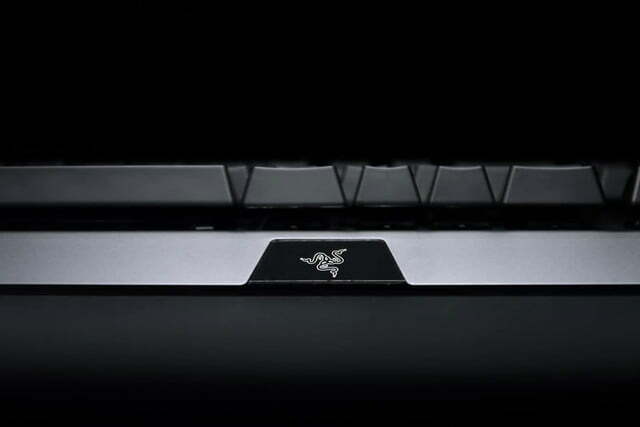 The only other ornamentation is the Razer triple-snake logo, backlit beneath a strip of glossy plastic at the bottom-center of the deck. 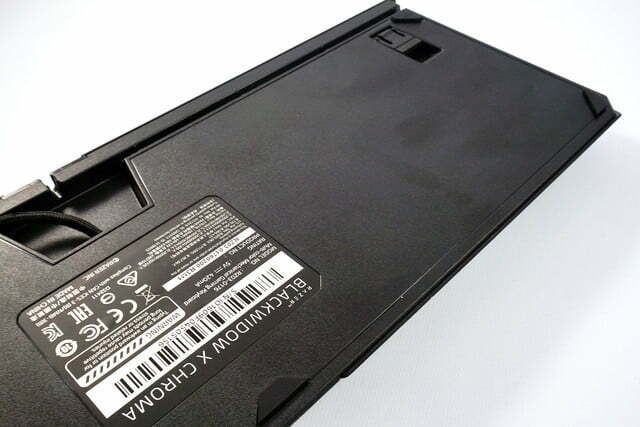 The exposed keys are much easier to remove, making cleaning simpler. 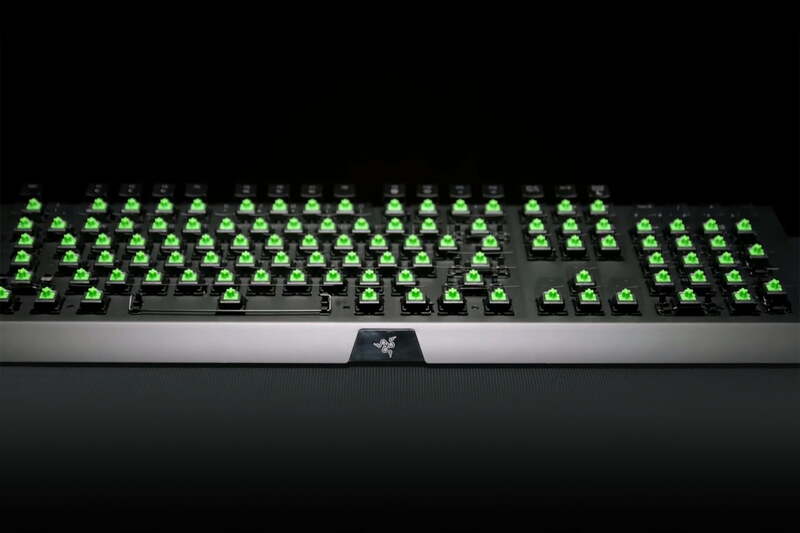 Pop off the standard Cherry-compatible keys and you’ll see Razer’s green, clicky switches. 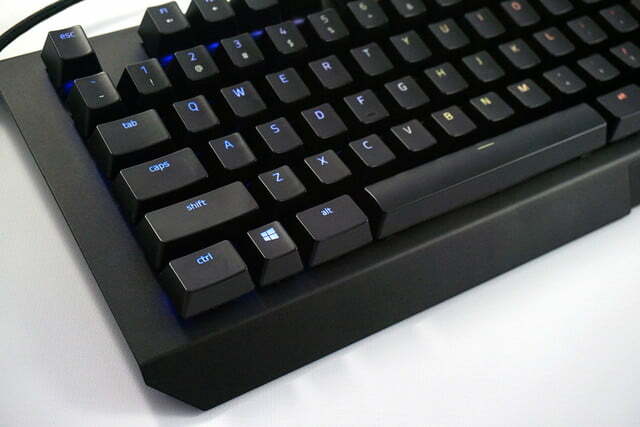 Cherry MX Blue switches are an option on some BlackWidow X models. The top-mounted customizable RGBLED backlights on our review unit shone brightly and clearly through each and every key. 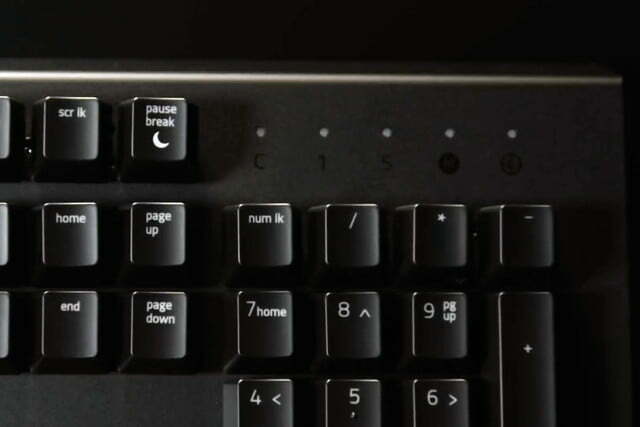 The keys’ shift functions aren’t lighted, but they’re easy enough to see below the primary functions. 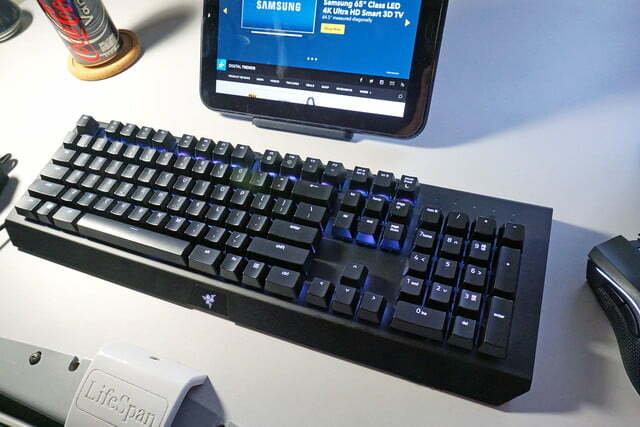 The only downside of the exposed metal frame is that the backlighting can wash over the keyboard and to other parts of your desk, even in full light – but some might consider that a plus. It certainly looks cool. 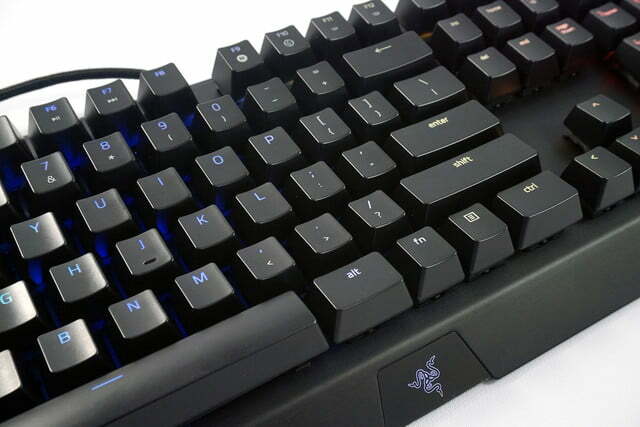 The exposed keys are much easy to remove, which means it’s a cinch to clean the keyboard or add custom key caps. 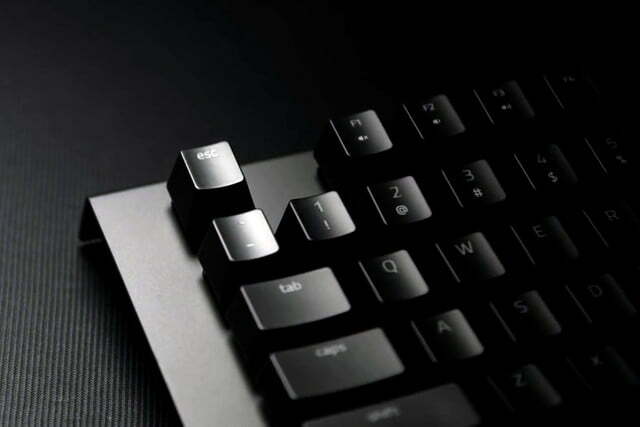 Unfortunately, the lowest row of keys aren’t a standard size, so keycap fans will have to hunt for unconventional sizes to match. Gaming on the BlackWidow X is more or less as you’d expect it to be. 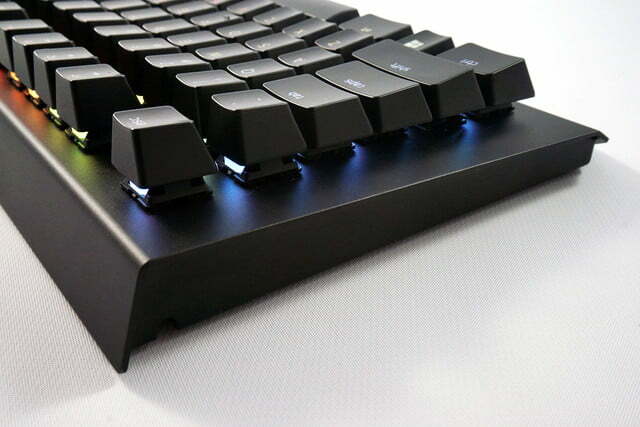 The long and satisfying travel of the tactile mechanical keys minimizes accidental strikes, and the typing experience is faster and more satisfying than any rubber dome or scissor-switch keyboard. The keys are loud, but that’s to be expected – indeed, it’s part of the appeal. Razer’s offers optional “stealth” switches for those seeking peace and quiet, but they’ll still prove louder than most inexpensive keyboards. 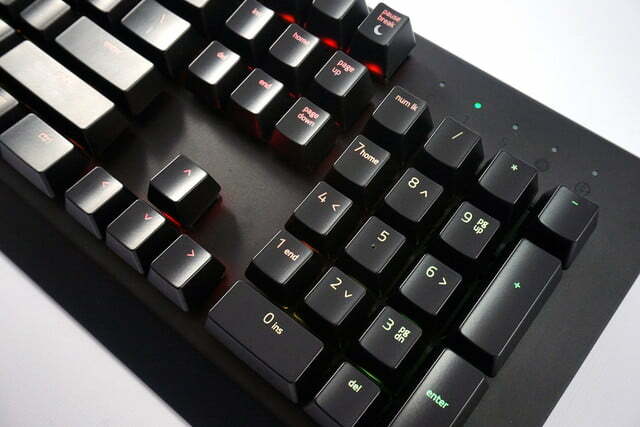 The stock key switches on our review unit proved enjoyable, but they weren’t perfect. 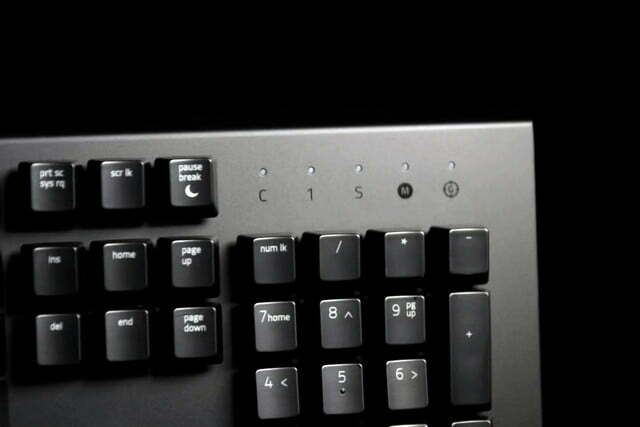 The keys felt a little looser than the Cherry MX blue and brown switches we’ve seen in most competing keyboards. It feels like the manufacturing tolerances of the switches or the keycaps aren’t on par with Cherry, resulting in a slight, audible rattle. 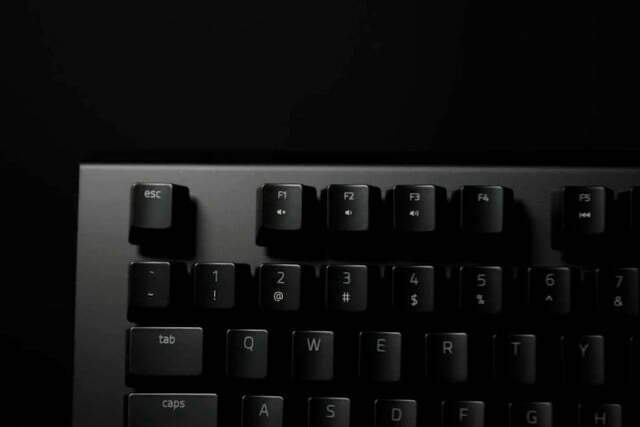 It’s not a huge issue, but it will bug mechanical keyboard purists. 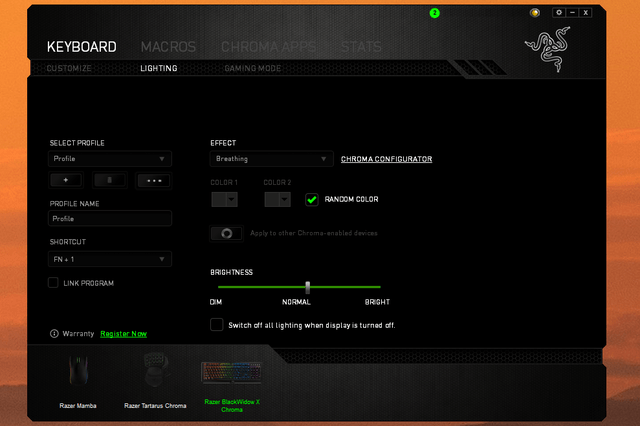 Razer Synapse is not necessary to use the BlackWidow X, but you’ll need to install it if you want to easily create macros or customize the lighting. (Macros can be created, with a little practice, using the on-the-fly function command.) 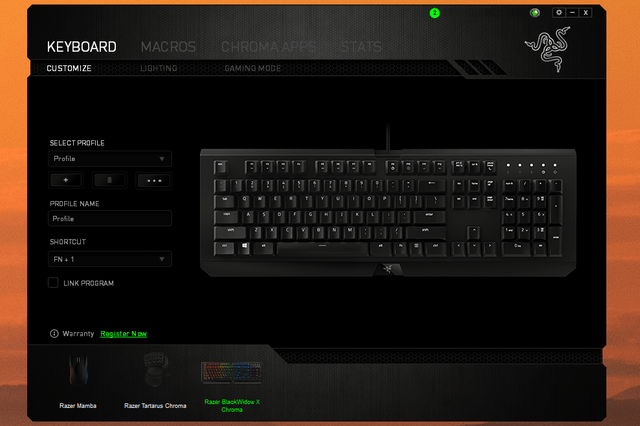 Razer still infuriatingly insists on a mandatory login system, something we will never stop hating, but once you get past it Synapse is functional enough. 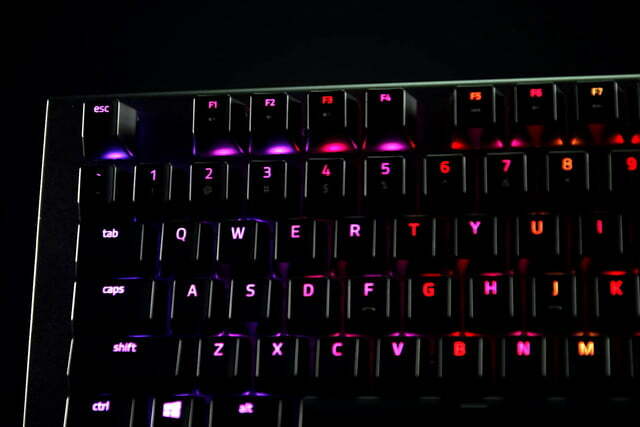 While extensive customization for keyboards isn’t all that vital thanks to custom keyboard controls in PC games, gamers who like to roll their own can still set up a nigh-unlimited number of profiles. 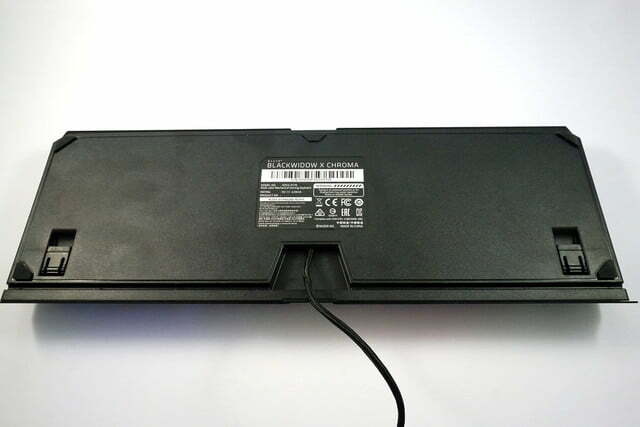 These profiles can then be activated with function commands or bound to specific games. Macros, more or less unlimited in number and complexity, can be bound to individual keys. 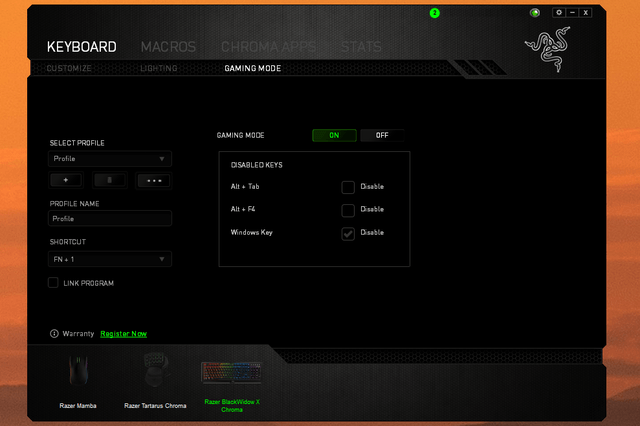 The “Gaming mode” tab allows the standard Windows alt-tab and alt-F4 commands to be disabled along with the Windows key. 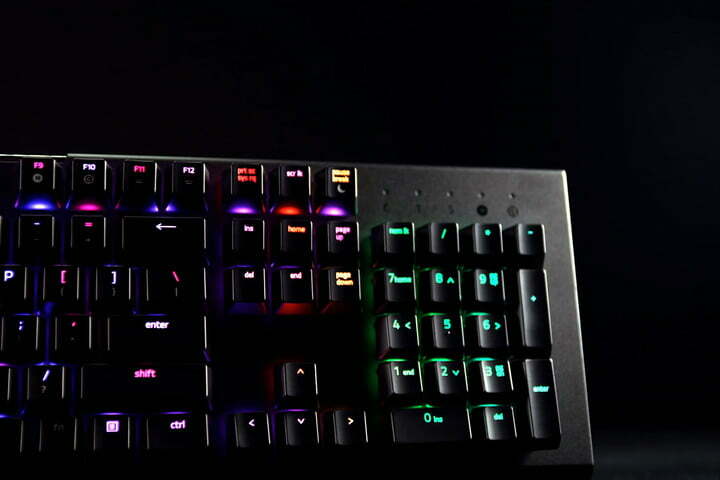 On the Chroma models, users can choose between six different multi-colored keyboard backlight patterns, which can then be synched with other Chroma -compatible devices. 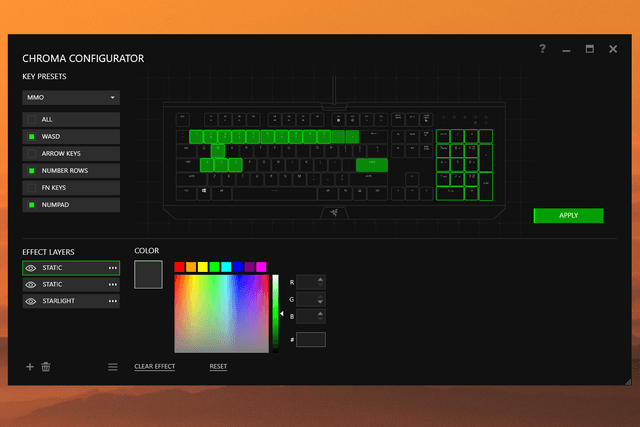 The Chroma configurator offers color templates for different gaming genres, grouped applications of different effects, and full RGB customization for each and every key. While we’d rather not turn our desk into a laser light show, we have to admire the dedication and complexity of the lighting tools. 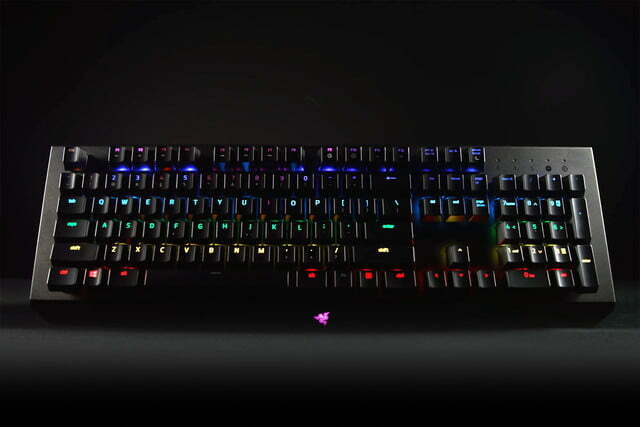 Our review unit was the BlackWidow X Chroma, a full-sized board with the Chroma RGB lighting system. It goes for $160, $10 less than the non-X version. Depending on key switch choice, that’s either the same price or slightly more than RGB-equipped competitors from Corsair and Logitech. The BlackWidow X Chroma Tournament Edition chops off the 10-key pad for $130, the full-sized BlackWidow X Ultimate has green-only LEDs for $100 even, and non-backlit versions of the BlackWidow X and BlackWidow X Tournament Edition retail for $80 and $70, respectively. Those are respectable prices, especially at the lower end. And it gets better. On top of the Razer Green (clicky) and Razer Orange (quiet) mechanical switch options on most models, some will come with an offer for Cherry MX Blue switches at a $10 discount. Those models are hard to find at the moment, but are an impressive value if you can track one down. 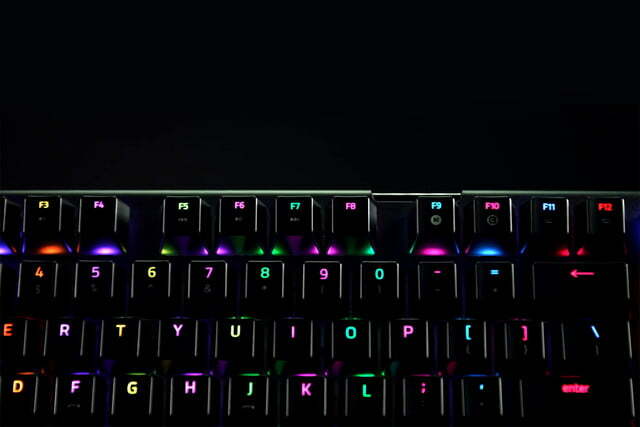 The BlackWidow X Chroma is a measurable improvement over Razer’s previous BlackWidow design, and it reinforces the brand’s status as the go-to for every gamer’s first mechanical keyboard.